We held our Annual Meeting after an abbreviated Sunday morning service on January 27. Father Nils thanked Harrison Fontaine and Meagan Eickelbeck for their service providing child care last year. We also thanked Claire Turner for all her work on the vestry. Claire had finished her term and stepped down. We welcome new vestry members MaryBeth Weisner, Cathy Gates and Trina Fontaine. Our new Warden is John Bernson. With snow and ice on Sunday morning, St. Stephen's postponed our Annual Meeting for a week. Our Music Director and Organist James Turner chose the prudent course and stayed home. So Father Nils served dual roles at that service: officiant and organist! Our third annual Cemetery Tour told the history of ten people interred in St. Stephen’s cemetery. Their stories illustrate the history of our town. Here we see Ed Woodyard portraying James Stivers, the blacksmith whose shop is now located behind Smith Tavern. Father Nils portrayed Rev. Samuel Bushnel. Kudos to Dakota Martin for her direction, and thank you to all the performers! St. Stephen's presented the first Good Neighbor Award to our wonderful local food market, DeCicco's. Lena Cavanna, of St. Stephen's Mission & Outreach Committee, introduced this first award, and told of the many good works DeCicco's has performed in our community. The DeCicco family posed with members of our Mission & Outreach Committee. The plaque presented was made from 300 year old maple that once bordered our cemetery and the DeCicco property. Sunday, November 11, was the 100th anniversary of the Armistice of World War I. Our very moving Sunday service commemorated this event. The flowers by Kelly Skaggs made an immediate visual reference to World War I, with "poppies," the flower that's come to be an emblem of the day. We hosted a representative of the Hudson Valley Honor Flight, Bill Sestrom, who presented a review of the program, which flies veterans (free of charge) from the area to Washington, D.C. to visit the memorials and be honored and thanked for their service. A highlight of the service was the reading of a letter written by a parishioner's father who was present in Paris when the Armistice was signed on November 11, 1918. Cole Kaiser did a wonderful job reading the touching letter describing the jubilation in the French capital, as Ralph Bradley of the U.S. Army 14th Engineers Battalion "saw the soul of France that day." Nancy Woodyard brought a German helmet found by her grandfather in the trenches during his service in World War I. It sat on the altar during the service, a symbol of all who fought in that terrible war. Here are more pictures of the service. We collected the histories of parishioners’ relatives who served, and made a booklet of their stories and photos. Download the booklet here, or contact the church office if you’d like a hard copy! St. Stephen’s Youth Group is supporting Feeding Westchester by contributing to their "Breakfast in a Bag" program. The group assembled bags containing cereal, Nutri-Grain bars and juice or milk along with a special handwritten note to brighten the recipient's day. These breakfast bags will be distributed to Westchester children and seniors in need. The annual convention for the Diocese of New York was held in White Plains November 9-10. 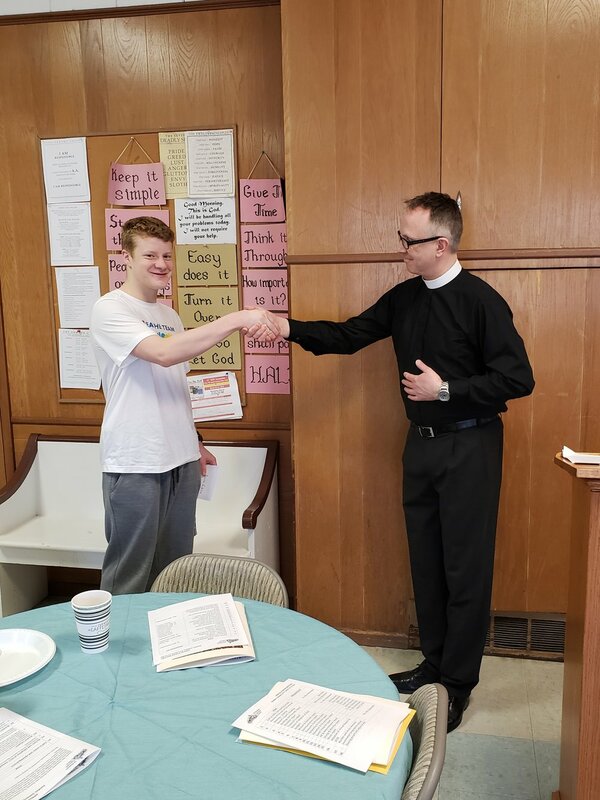 St. Stephen's was represented by lay delegates Doug Campbell and John Bernson, and Clergy was represented by our Pastor, Father Nils Chittenden. Overall, 300 clergy and lay delegates were in attendance. The attendees were a diverse group -- Hispanic, African-American, South Asian, North Asian, and of course, male and female, gay and straight -- fully representative of the New York metro region. The convention focused on a common theme of "The Beloved Community" and highlighted activities of the Diocese that promoted health, love and caring within our communities and on a global basis. The convention was both positive in tone and efficient, with a balanced budget presented of $11.2 million. Bishops Dietsche, Shin and Glasspool all addressed the assembly, and their messages are well worth reading on the Diocesan website. The Convention's first day concentrated on two themes: community and historical reflection. In the morning we participated in a workshop about how to build trusting relationships with people who are different from ourselves. We learned that we need try to listen better (more empathetically), to think more before speaking, to examine our own assumptions more carefully, to trust ambiguity and uncertainty, and to avoid hasty judgments. In the afternoon, we watched a moving play about slavery and the Episcopal church - a mixed history. Among the few Episcopal heroes of the anti-slavery movement were William Jay (of Katonah) and his son, John Jay II, both of whom withstood fierce criticism from the Church and from local residents for their anti-slavery activities. We were pleasantly surprised to learn that St. Stephen's is one of a small minority of congregations fully compliant with all of the Church's guidelines - another indication that St. Stephen's punches above its weight class. On the second day, a common workshop was led by Dr. Eric Law, founder of the Kaleidoscope Partnership, that specializes in conflict resolution. All attendees actively participated in techniques for creating a "Beloved Community". His one final takeaway was "listen to the silent ones to learn the truth". 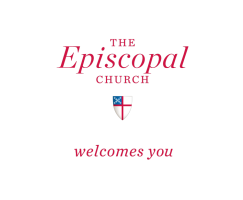 The Episcopal Church is accepting applications for the position of Deputy to Executive Officer, a member of the Executive Office of the General Convention. The Deputy to the Executive Officer organizes and oversees the canonical research work of the General Convention (Parochial and Diocesan Reports and related data), working with professional consultants, Church Pension Group (CPG), and other partners doing demographic and statistical analysis. The Deputy also organizes and oversees the responsibilities of the General Convention Office (GCO) related to face-to-face meetings and events planning/execution, and coordinates staff and consultants in the logistics of the meetings of General Convention, Executive Council, Interim Bodies, and other such meetings as they are planned and accomplished. At the request of the Executive Officer, the Deputy represents the Executive Officer at meetings and as Deputy Registrar, and does other duties as assigned. For more information contact Episcopal Church Human Resources at HRM@episcopalchurch.org. Standing with our Jewish friends in love. We have all heard yesterday's terrible news from Pittsburgh, where a gunman, fueled by hate and rage, murdered eleven people in the Tree of Life synagogue in Pittsburgh. All of the faith communities in Armonk are brothers and sisters together - we are all children of God. I and my fellow clergy have been in close contact throughout yesterday and today to offer our love and prayerful support to each other and especially to Congregation B'Nai Yisrael (CBY) here in Armonk. In my sermon yesterday morning, I spoke of the measures that CBY has had to take over the past few months to ensure the safety of their congregants. Yesterday's attack in Pittsburgh has, of course, intensified that sense of apprehension and concern. These are dark days for our country, where we are seeing - yet again - a fracturing of our society, as a fault line opens up. Whenever our society fractures, as it has done many times before, our instinctive reaction is to rush to one side of that divide, or to the other. In my sermon this morning, I offered a vision of an alternative place to that, which is actually the place that God calls us to be: bridging the chasm so that the fault-line can be healed and people can be brought back into reconciliation with each other. One way we can support each other at this time - by being those bridges of hope - is offered to us by our Jewish friends in this neighborhood. 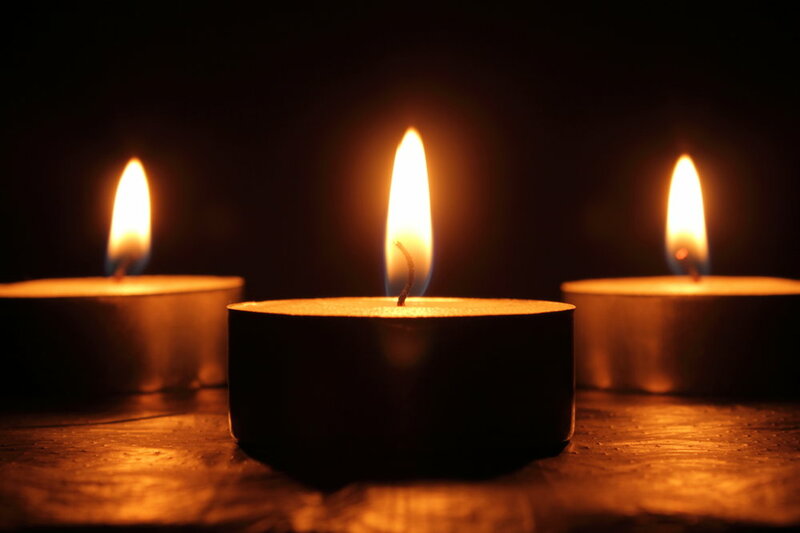 I invite you to join me, and members of Hillside Church, St Patrick's Church, St. Nersess' Seminary and Congregation B'Nai Yisrael in a Memorial Service on Monday, October 29 at 7:00pm at Temple Shaaray Tefila, 89 Baldwin Rd, Bedford Corners, NY 10549. These are troubling and uncertain times in our world, but please know that God always keeps us under the shadow of his wing. On Saturday April 14th, members of the St. Stephen's Youth Group, along with Trina Fontaine, volunteered at the Mobile Food Pantry, which was parked at the Boys and Girls Clubs in Mount Kisco, to help give out fresh fruits and vegetables to people who are in need. After a successful morning handing out food, the students walked over to the local diner. While they waited for the food, we shared our thoughts about the morning. "It feels good knowing that even doing the littlest thing for the community helps" said Valentina. "I love helping people and it is so rewarding to see smiles on their faces" added Meagan. While handing out food Daniel realized that the families may not have had enough to eat but was grateful this helped them. The students also found out they helped approximately 300 people, something Kristin is really proud of. Antonella found the gratitude people showed very heartwarming. The Youth Group truly enjoyed volunteering and are looking forward to doing it again in the future. 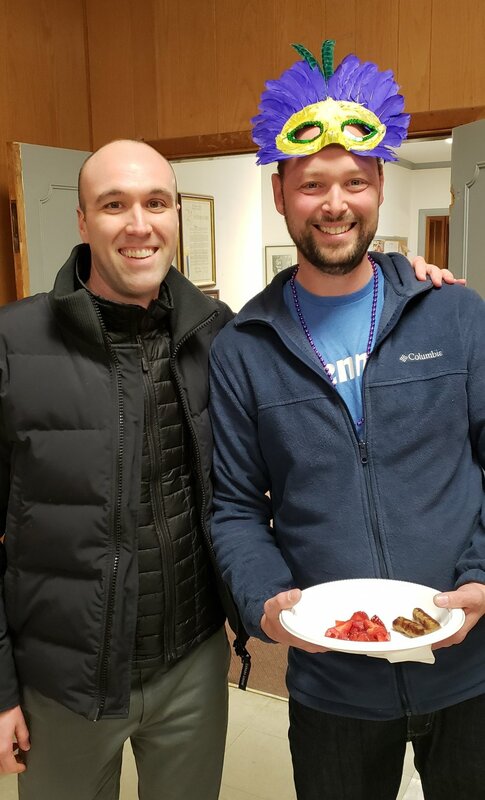 During Holy Week St. Stephen's welcomed 15-20 homeless men and women each night, guests of the Emergency Shelter Partnership (ESP). 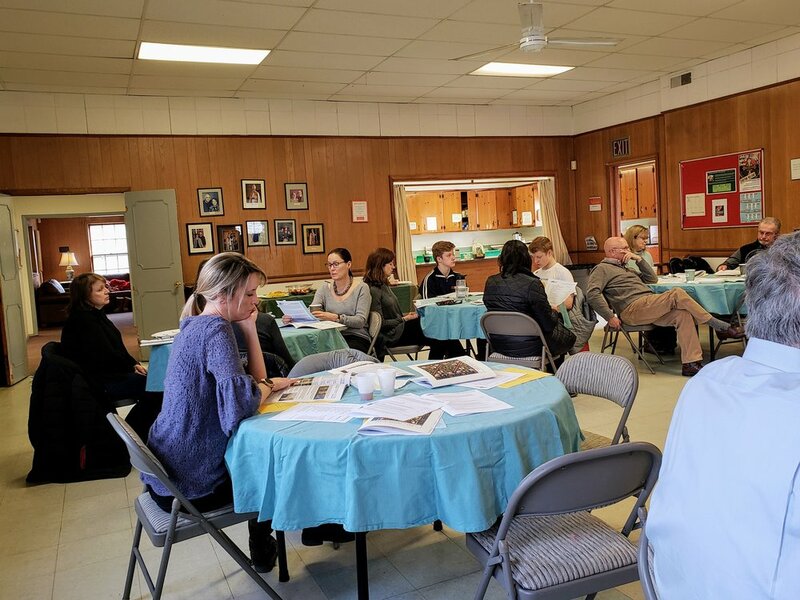 Although St. Stephen's was the physical location of this shelter, we did this in full partnership with four other houses of worship in Armonk: Hillside Church, Congregation B'Nai Yisrael and St. Nersess Armenian Seminary. Through the coldest months of the year, ESP coordinates with local houses of worship to volunteer for a week-long period where ESP's guests can have dinner, sleep, breakfast and a brown-bag lunch. Founded by Mel Berger over thirteen years ago, as a response to homeless people dying of cold exposure, this vital program has saved lives in northern Westchester and offers hospitality and dignity to those who are suffering. As the card from one of our guests this week says, ESP makes a difficult situation a bit more tolerable. Not only that, but our volunteers, including our youth, have learnt more about homelessness, and about our Christian calling to serve others in response to Christ's call to love one another as he has loved us. That we were privileged to serve with ESP during this special time of Holy Week and Easter is a serendipity. St. Stephen's volunteers support the Mount Kisco Interfaith Food Pantry by making weekly deliveries for housebound clients of the Pantry. Annlee Milani and Sue Brown, pictured, head out on the one hour mission to deliver to the few who can’t make the trip to the pantry. We welcome volunteers to this Tuesday afternoon outreach! Our Youth Group produced many beautiful and tasty treats for the Frosty Day bake sale, yielding $241 in proceeds, to benefit those affected by Hurricane Harvey. Thank you to all contributors of baked goods, and to our sprightly Youth Group, who devoted their day to the effort. 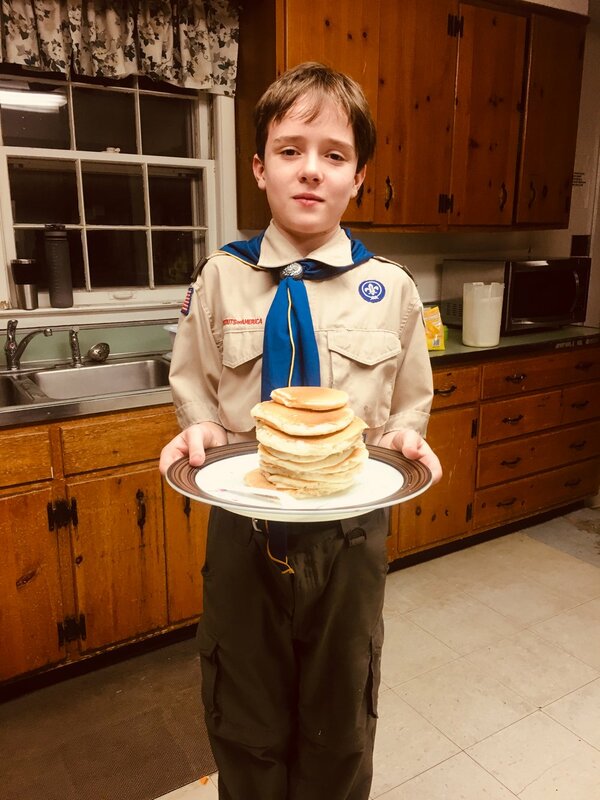 A special shout out goes to stand out sellers Dale, Calvin and Abby, who took the sale to the customers, heading outdoors to hawk their treats! Extraordinary Ventures New York was a popular stop in the Frosty Fair, selling handmade scented candles and bracelets, seasonally packaged. 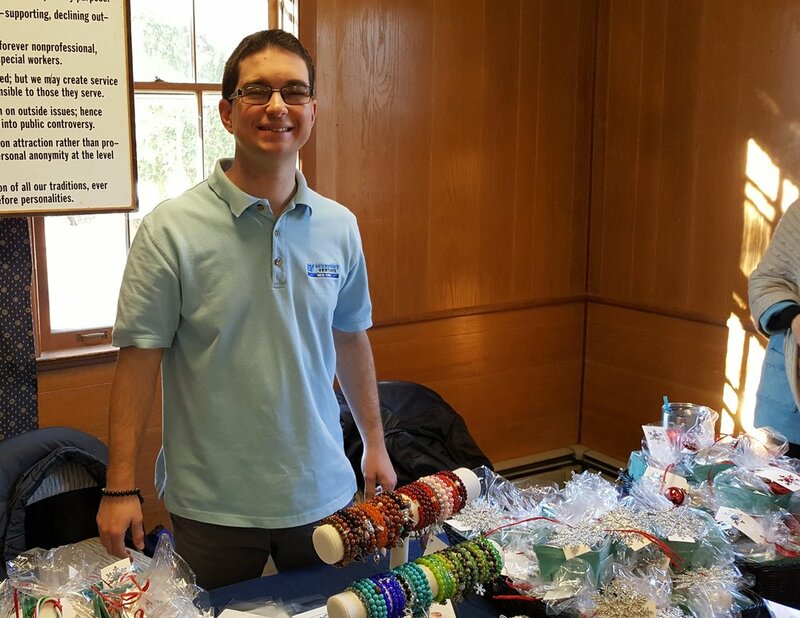 The wares were produced and sold by adults with autism. Kelly Skaggs Florals set up a lovely table selling seasonal flowers and wreaths. Office staff can attest the paperwhites are already scenting the air, and wreaths are adding their Christmasy welcome. Our Second Annual Cemetery Tour, enacting the lives of twelve people interred at St. Stephen's, was a great success! It took three staggered performances to handle the attendance. Kudos to the cast of the cemetery tour, and to George Pouder, who researched the history and Dakota Martin (center), who directed. Above: Chair of St. Stephen's 175th Anniversary Committee Meg Gregg is presented with a thank you gift from the parish for her excellent work spearheading our year long celebration. So many of you contributed your energy, enthusiasm and the precious commodity of time for our successful celebration. 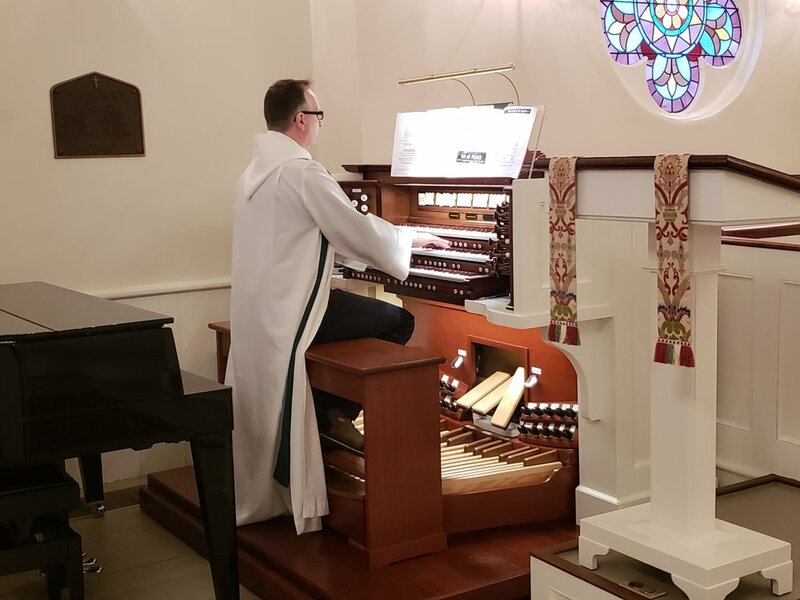 In addition to our two special church services, we enjoyed organ recitals and other musical events with receptions, parish teas and lunches, a square dance and history exhibit, cemetery tour, Dave Barry reception and talk. We reached out to the larger community and brought them into our beautiful church. Thank you, thank you. A special note of appreciation to the 175th committee members who met faithfully for almost two years, always with good ideas, great local contacts, and hard work: Carol Mortell, Paul Lashmet, Michael Ramsey, Claire Turner, Ed Woodyard, Charity Lunder and our "can do" Rector, Father Nils. The culmination of St. Stephen's 175th anniversary year was a beautiful Choral Concert of Vivaldi's Gloria and other music. Though it was a night of torrential rain, the church was packed full. We were lucky to hear the début of an astonishingly lovely new piece specially commissioned for the event -- "How Lovely is Your Dwelling Place" by Paul Mealor, honoring both St. Stephen's and Armonk in our joint 175th anniversary. 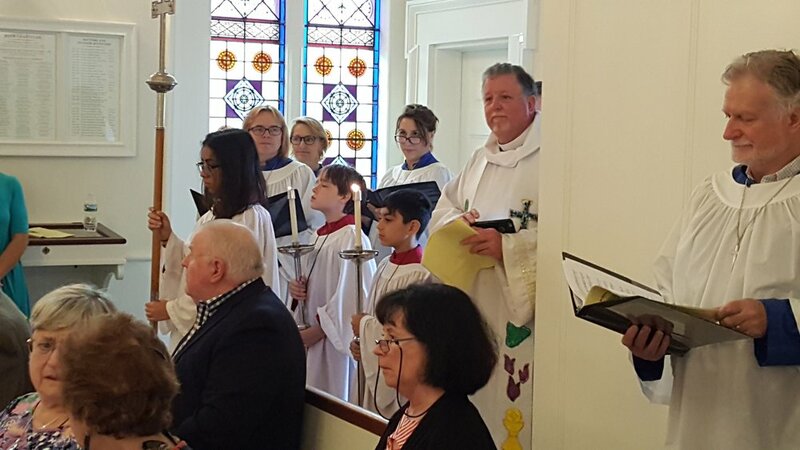 Many thanks to the St. Stephen's Chorale, organist Terence Flanagan, and above all to our Music Director, James Turner, whose unflagging efforts have made our church central to music in Armonk. The reception following the concert resembled a town party, with community members of all sorts come together. Due to the fun and hubbub, there are no photos! Many thanks to Claire Turner and the young Turner helpers for arranging the very successful gathering! St. Stephen's celebrates 175 years! On October 8, St. Stephen's 175th anniversary service filled the church with parishioners and friends! It was a lovely day, the culmination of a year of events celebrating not only our 175th anniversary, but the town of Armonk's as well. Above, Father Nils (XVIII Rector) is joined by Father Harry Abernathy (XVI Rector), who preached the sermon, and sported a stole made for him by a St. Stephen's Sunday School class of the mid 1990s. Kelly Skaggs provided a stunning autumnal flower arrangement for the altar. Father Harry delivered the sermon "Where Do We Go from Here", which can be found at this link. There was a delicious parish lunch after the service, catered by La Mer Seafood. 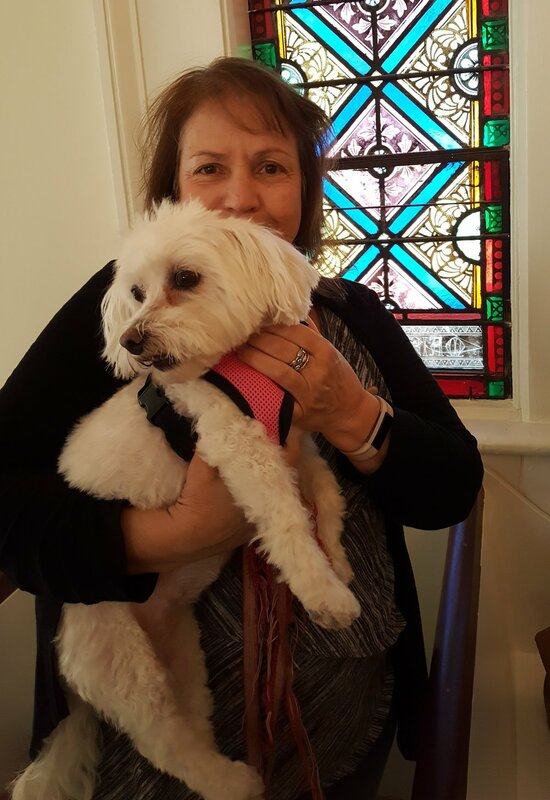 The Blessing of the Animals on October 1 brought out many pets, along with stuffed animals and framed photos!